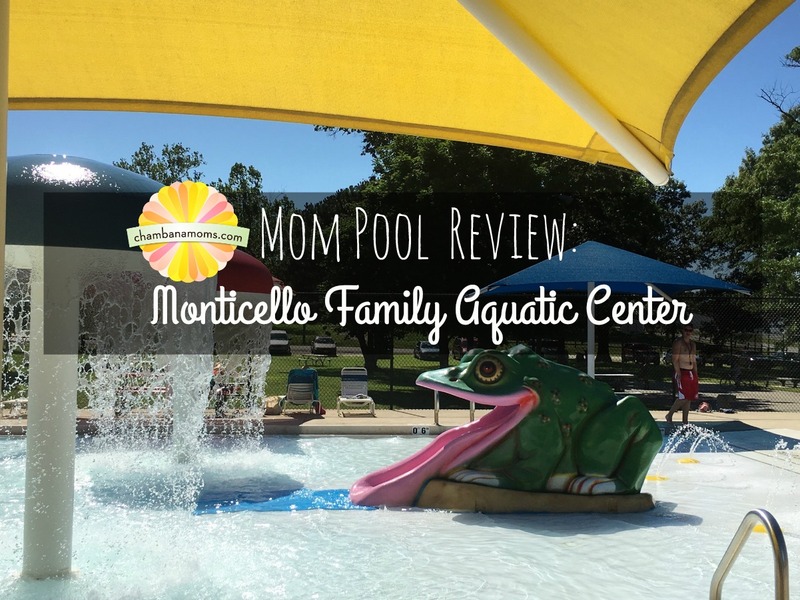 Just minutes from Champaign-Urbana, the Monticello Family Aquatic Center offers a smaller, but no less fun, afternoon spent by the pool. 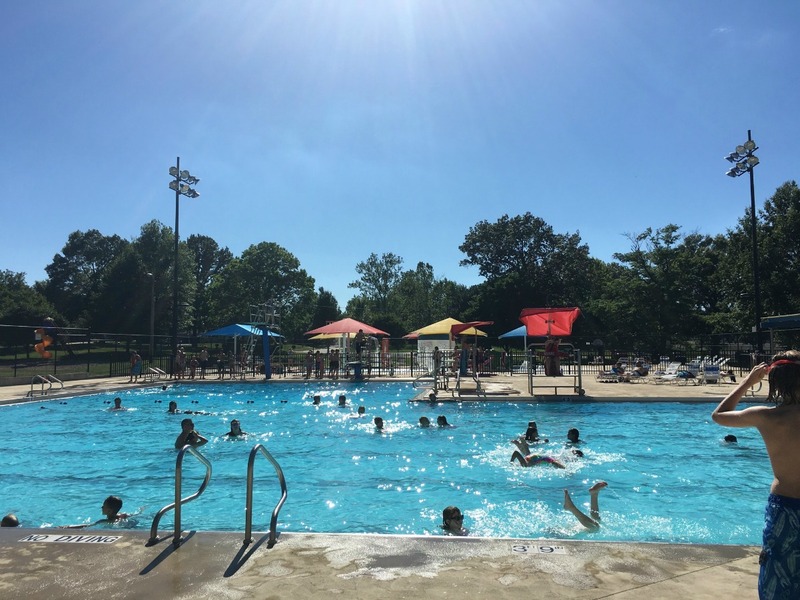 Nestled on Railroad Street, the Aquatic Center is surrounded by a lush and shady green park with some play equipment, including a tornado slide, and tennis courts. There is plenty of parking in a lot in front of the Aquatic Center, and racks for bike riders. At $5 per person, the entrance fee for a non-resident was on par with the size of the pool. Bonus: The pool entrance can swipe cards if you forget your cash. The pool has a small concession stand, cash only, that sells the usual nachos, chip, candy, and ice cream treats. The prices are fair, but I missed seeing some healthier options on the menu. You can bring in your own food as well, but it must stay in the concession area. There is a water fountain in the concession area. The prices were reasonable, and staff very friendly. The concession area is shaded and offers ample seating. It’s summertime in Monticello and the water is fine! Photo Credit: Chambanamoms. The main pool features a flume style water slide, given a “4 out of 10 for speed and scariness factor” by my 11-year-old . Both he and his 9-year-old brother were excited to see two diving boards in the main pool, and warmed up to the smaller of the two diving boards first. From then on it was all high dive all the time for the rest of our afternoon at the pool. They loved it! We were at the pool right at about 4:30 p.m., and found minimal shade around the main pool area. Be prepared for a lot of hot concrete. Grassy areas are fenced off from the pool. Bring your shades, flip flops, a hat, and a lot of sunscreen. There are ample loungers and chairs, and it seems to be OK to move loungers about to different areas of the pool. The most charming aspect of the pool, in my mom opinion, is the zero depth pool area. Designed with little ones in mind, it is filled with fun sprayers, a froggy slide, a water wall and tons of fountains. My younger boys LOVED playing in this area. The kid zone is fenced off from the main pool with latched gate access. There are shade zones around the zero depth pool zone, picnic tables, and loungers. The Guards gave patrons 15 minute adult swim breaks every hour or so. While my boys were not happy to sit on the side of the pool for 15 minutes, it was a good opportunity to do a little swimming without getting splashed in the face. The Monticello Aquatic Center does have mens’ and women’s dressing rooms, however it does not have family changing rooms. I had to trust that my older boys could monitor my 6-year-old and help him change. While they did fine, I missed the family changing room. The pool has a small video game room when you first enter. It’s easy for little ones to miss if you’ve never been before, but if you have a kiddo that might need coerced to spend the day at the pool and not on gaming devices, take note. I managed to hustle my crew from the pool without any time spent in this room, but that’s only because they were starving for dinner. We made the super quick drive over to Monicals in Monticello for dinner. My kids loved the atmosphere. They have large family-friendly movies posters for decor throughout the restaurant, as well as portraits of children. They also loved the kid activity placemats with mazes, puzzles, and family conversation prompters. The food was fresh and delicious, the service prompt and attentive, and my kids ate every single crumb of their dinner. Pizza dipped in French dressing a requirement, of course. My crew was happy, cooled off, and tired after our fun afternoon in Monticello. All in all, a great afternoon at the pool! Season Pass Prices: Discount day on May 17.